« Integrated Bridge: Hush, Hush ! The dual toroids at the input … is a legacy that needed to be accommodated for, but finally turned out to be a very optimal set within this atypical application. Two identical twins, with Primary 230V AC and Secondary 1260 VAC — 0 — 1260 VAC. In series connection they “could” provide evenly split secondary voltages, provided that they are equally loaded. But within this specific topology – they actually are evenly loaded, providing two sets of 630 VAC – 0 – 630 VAC on the secondaries. 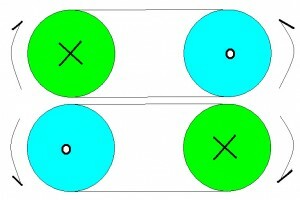 The identical twin character of these toroids provides the additional benefit, that if stacked one on top of each other, and provided that the phases of the primary connections are correctly matched with each other, then we can achieve a “super-toroid” pair, with a magnetic field partial self-cancelling effect. As to the rectifiers, I played it safe and went for a series connection of high voltage diodes, the VISHAY BY 228 type. Each with ferrite beads (tubes, rather) on their connectors. The diodes then paralleled with pairs of series connected 1M resistors (a reverse voltage equal divider network) and 33nF/630V capacitors (a reverse impulse spike equal divider and snubber). .The front and back of such a grouping of two diodes (with satellites) is series terminated with ferrite chokes, 1,5mH/2R7. Such whole contraption is encapsulated in an embrace of a pair of series connected 15nF/200V secondary snubber caps. The caps of the filter, due to the high voltages, need be arranged in a two-storey stack, with even voltage resistor dividers, and equal valued bypass capacitors. The output of the power supply provides two sets of symmetrical rail voltages. 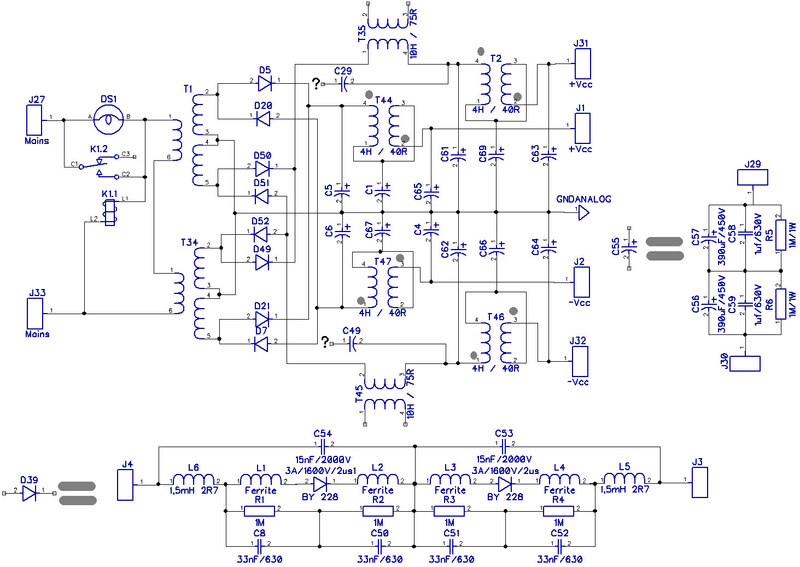 One pair is based on CLCLC type filtering, and provides +850 VDC and -850 V DC. (“HHV”). 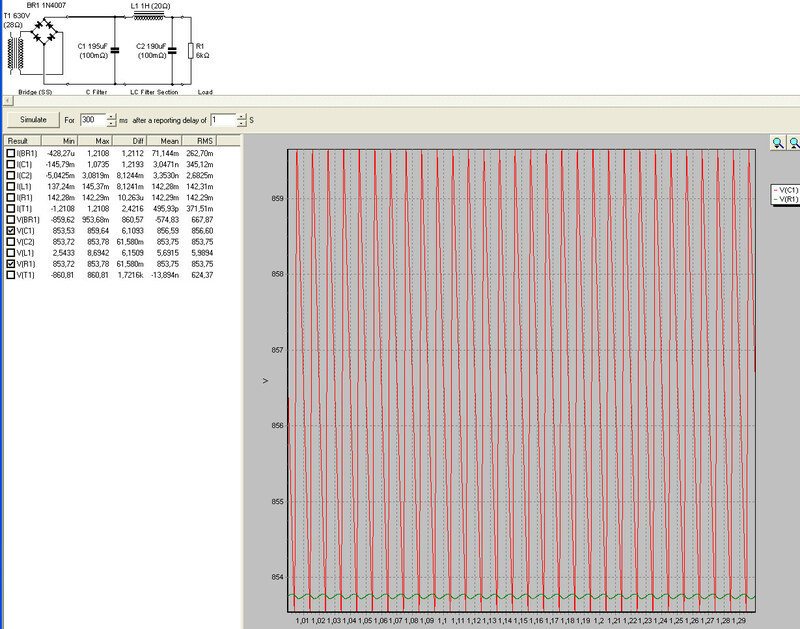 The other pair is based on LCLCLC type filtering, and provides +590V DC and -590V DC. (“HV”). b). each of the half sine waves, so that each half sine wave has exactly the same amount of work to do. Specifically, each half sine wave starts of with one half of each toroid loading a C front loaded HHV filter. This taking place with voltage lagging relative to current (the current needs to flow into the cap so as to build up voltage on it). 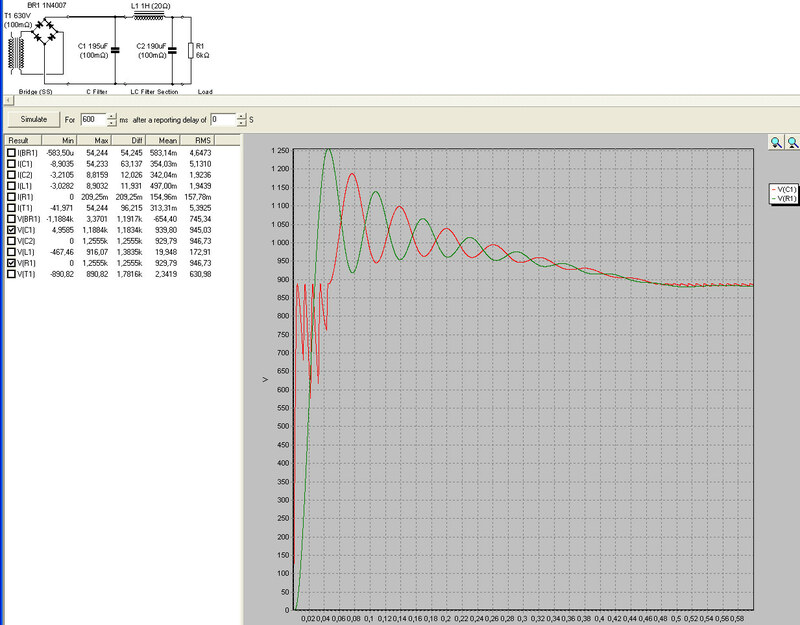 The other half of the same toroid is pushing voltage against the taps of a L front loaded LCLCLC filter. 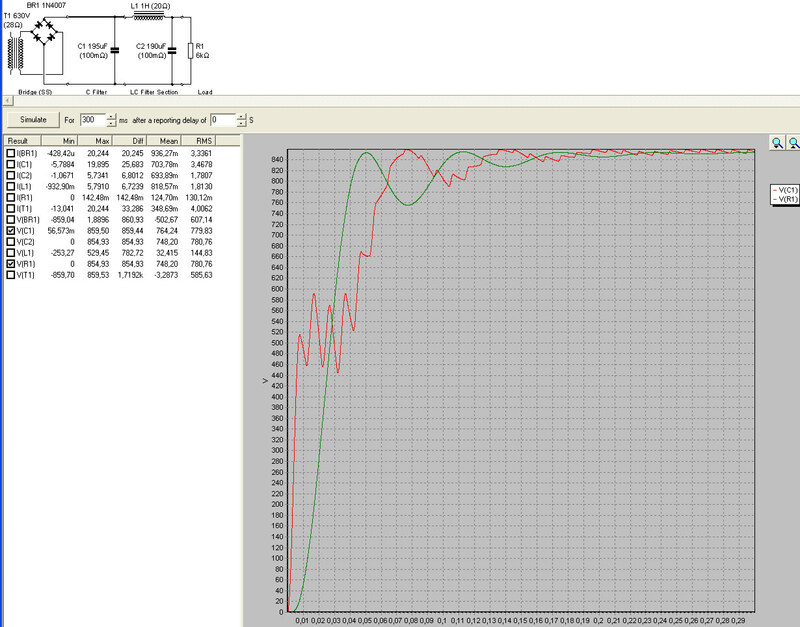 This filter providing a slightly lower, HV voltage at its output. This taking place with current lagging voltage (as the magnetic field, and current, needs to “spin up” first within the choke). Exactly the same work load is imposed upon the mirror twin toroidal. This one also working to one HHV rail and one HV rail, put complementary to the aforementioned. Please take note that irrespective of the momentan current demand of ANY of the rails, we have always an even loading of both toroidal transformers, as each consecutive half wave pumping a specific filter and output rail originates from the “other” toroidal transformer twin. This architecture implies also that the currents flowing through secondaries of both of the toroids is the same. This also implies equal magnetic field strengths within the twins. So, the rationale is as follows: If we mount the twins in such a fashion, one on top of the other, that at any specific moment in time one of the magnetic fields is rotating clockwise, and the other anti-clockwise, we then literally obtain a magnetic field self-cancellation effect. Well, at least upon the boundary of their direct contact with each other and on a significant area of the side walls of the toroid stack. Now, another small sidebar, regarding … The actual helper chokes, the smaller ones, the “transformer-chokes”, are connected in a configuration that I have tested before and works well for me. The DC magnetic field components fight against each other, rendering a net magnetic flux of around zero (equal turn windings). But the AC ripple current path is a totally different story. The Ripple of the first half is routed via center-cap to ground. This ripple creates an AC magnetic field which is in ANTI-PHASE to the magnetic field of the next consecutive LC half of the circuit. The fist half of the choke fights the AC component of the ripple of the second half of such a “transformer-choke”. Now, having presented the concept, my big question to you is the one relating to the two “question marks”. Specifically, the two capacitors spanning a-typically, between the HHV (from the first C-front loaded filter) and the HV voltages (from behind the main L-choke front loaded filter). 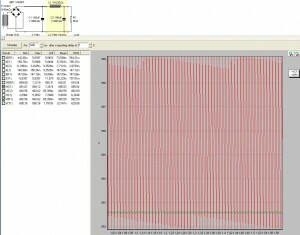 Since, as earlier mentioned, we have close to opposite phases of the voltage lagging current in the former case, and the current lagging voltage in the latter, …. which for me sounds like a close to 180 degrees phase shift …. …. my big question is what follows: would there be any “filtering benefit” in closing that cap connection ? If indeed so, Let us call it the “CHET”, or the “Cross Hum Elimination Topology”, (C) 2014-08-18, zjj_wwa, of hiend-audio.com. 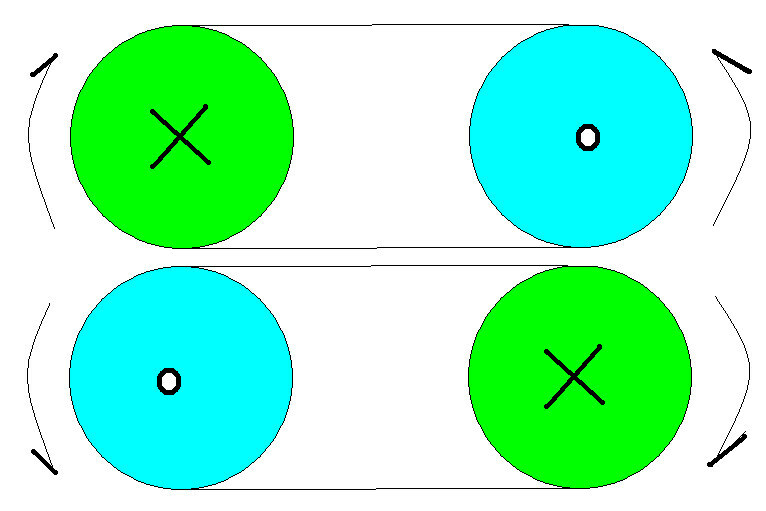 The rationale for this CHET capacitor is as follows: there is a significant amount of ripple in each of the two nodes, to be connected by the bridging CHET cap, … But the ripple at each of these nodes is in ANTI-PHASE with respect to the “other” ripple, the one on the other end of the bridging CHET cap. 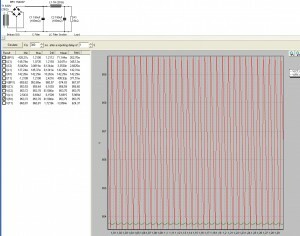 What’s more, the voltage value of the ripple (as simulated in PSU Designer) is more or less the same, within something like 7 V peak to peak in both of the nodes. So, if my assumption is indeed correct, by adding this “inter-filter” CHET cap, we create an “anti-phase-rippling bridge”. Therefore, we shall gain additional filtering benefit. Correct? I guess that in end effect, I will need to put my goggles on and try it out. The risk being taken here are the initial voltage overshoots that are inherent to the start up of such HV filters. It just may be that the overshoot will be significantly of what the filter caps can endure (i.e. 450V+450V = 900V). 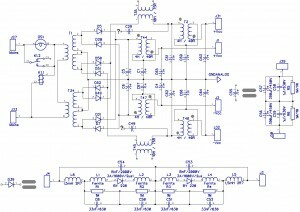 In order to secure myself from overshoot, as it turns out in PSU Designer, I could substantively “worsen” the ESR of both of the filter caps, hence introduce damping, and hence fight the overshoot. But the side effect of that is that the filtering quality goes down the drain, from a reasonably respectable tens of milivolts hum to a few hundreds of milivolts. Or better yet, choose neither poison, and stay healthy, with neither overshoot, nor with worsened filtering quality. Simply switch the whole thing “on” in two stages. The second switch-on phase taking place one or two seconds after the soft-switch on. It suffice that we increase the impedance of the secondary of each transformer to something like 30 ohms, for the initial duration of one or two seconds, so as to get rid of the overshoot completely. Such resistance, transformed by the square of the winding ratio to the primary side, could simply be a part of the main soft-start circuit, provided that the soft start would have a time constant of at least one second, which would be enough to get over the initial cap-load-up, inductor-field-start-up and overshoot-risk phase. Hmmm …. It turns out that the soft start on the primary (which now will need to be changed to something more finesse than the simple bulb + relay!) will essentially be obligatory. 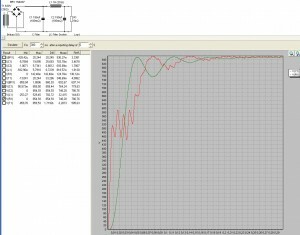 thrown into the PSU simulation I actually did come across peak overshoot voltage values ranging 1250V (with 0,1 ohms primary DC resistance, with 0,1 ohms ESR of the filter caps). 1250V DC peak would be more than enough to blow a stack of two 450V DC rated (=900V total) electrolytic capacitors. 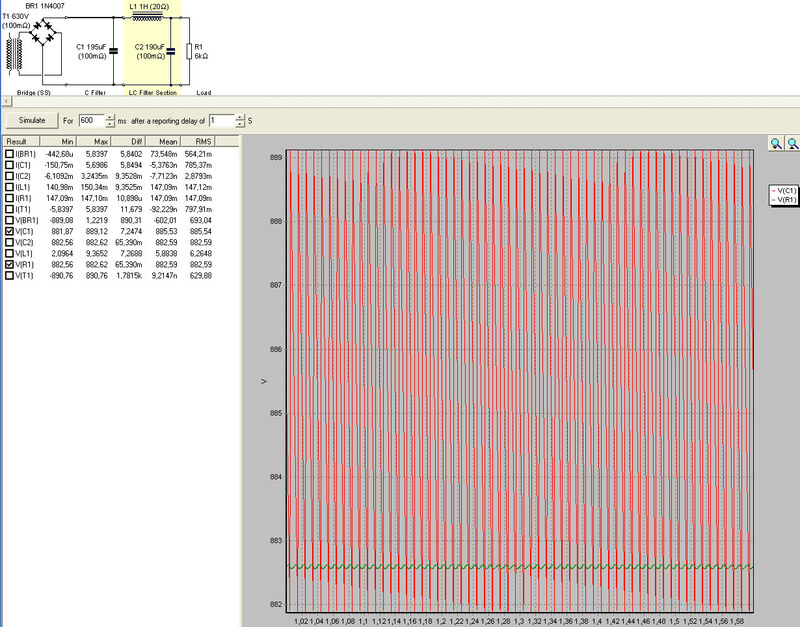 This first set shows the horrendous overshoot of voltage at switch-on. Enough to blow the filter caps. This is an effect of a stiff transformer (with low impedance of the winding) in connection with low ESR of the caps. Low damping results in big oscillations at start-up. Now, this one shows what I was talking about with regards to establishing a soft start, in terms of bumping up the impedance of the transformer winding up to about 30 ohms or so … This is damping that essentially keeps the green line in curb … it does not exceed at any moment the “final” or target output voltage. Under these conditions, whilst the dust settles, the ripple is also at an acceptable level. But please do note that the output voltage is now sagging. It is significantly lower than before. So the best would be, if we “get rid” of this additional series impedance of the transformer winding, after a few seconds after switch-on.